A father was killed and three of his children critically injured in a 2-vehicle crash Monday in Gorham, Maine. 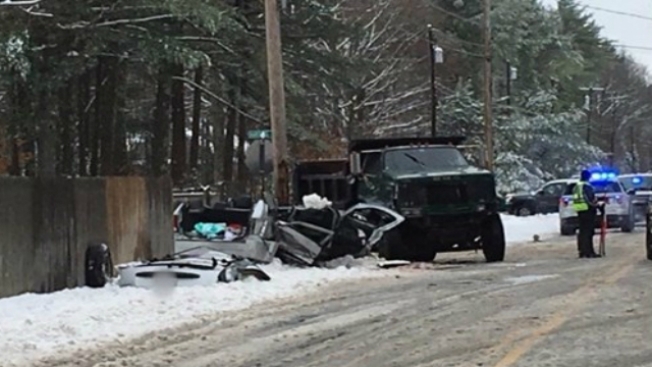 According to WCSH-TV, a dump truck and an SUV carrying a family of five were driving on opposite sides of Route 202 around 10 a.m. when the SUV lost control, crossed the center line and was struck by the dump truck. The man, who was a passenger in the SUV, died at the scene. The mother and three children were taken to Maine Medical Center. The children are in critical condition, while the mother's injuries are believed to be less serious. Gorham Police Sgt. Dan Young said the crash was the worst he's seen in his 22 years on the job. The cause of the crash is not yet known. Young said the road was plowed but conditions were icy.